Three men, and three totally different looks that have taken to the scene over the past few days. Tommy Dorfman: At the 2017 GLSEN Awards on Friday (October 20) in Beverly Hills, California, Tommy donned a Calvin Klein look that was notable for its dynamic fusion of retro sportiness and moto edge. He actually made it work, too. 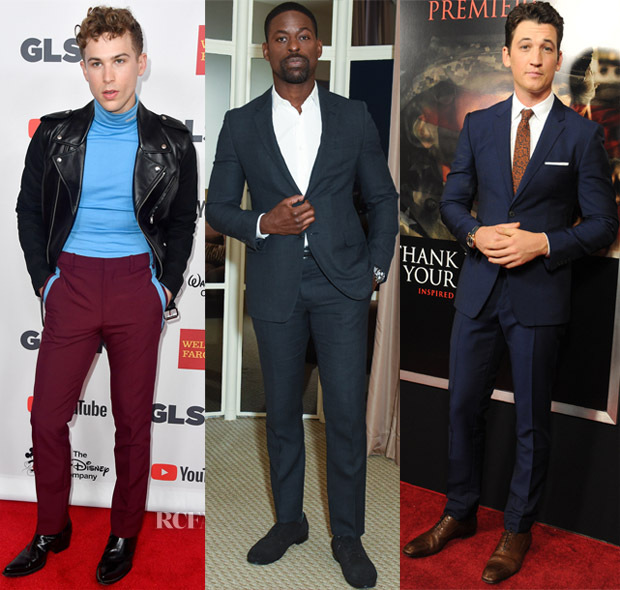 Sterling K Brown: Along with the fashionable femmes in attendance, the actor also was in the mix at the Valentino x InStyle Cocktail Party in LA on Sunday (October 22). Naturally, he was wearing Valentino, too, offering up a casually suave rendition on classic tailoring. Miles Teller: Suited up to a tee, Miles was sartorially sharp as per usual in this Burberry look at the ‘Thank You For Your Service’ premiere on Monday (October 23) in LA. I like this mix of intense navy and burnt orange on him.